The 1980 Summer Olympics left a rather curious architectural legacy in Moscow. But what are the stadiums and athlete hotels used for now? The Olympic Games were held in Moscow in July and August 1980 — the first time the Olympics were hosted in the Soviet Union or Eastern Europe. In just a few years leading up to the games, about 80 facilities were built in cities around the USSR, including Tallinn, St. Petersburg, Kiev and Minsk, all of which also hosted various events. Of course, Moscow has the largest number of sports facilities that have survived, and these are not just conventional sports centers but also entire residential areas and parks. Even after almost 40 years, the grand scale of these objects is still impressive. Europe's biggest indoor stadium, located on Prospect Mira in Moscow, was built in just two and a half years. There are actually two venues here: a swimming pool and an oval-shaped stadium that seats 30,000 people. The Olympic complex, known locally as Olimpiyskiy, did not go unused after the Olympics and went on to become one of Moscow’s most popular concert venues, where stars like Madonna, Paul McCartney and Lady Gaga have performed. Furthermore, numerous sports clubs have opened here, including a swimming club. A book fair used to take place at Olimpiyskiy, and later a big discount shopping center selling popular brands opened. The stadium and swimming pool were closed for renovation in 2019. The sport venues are scheduled to be upgraded in the next two years and include plans for a cinema and a café. Owing to their unusual shape, these two prefabricated-panel buildings in Moscow's southwest are nicknamed "The Bagels." Initially, the plan was to construct five buildings in the shape of the Olympic rings, but the architectural experiment was halted after two when the structures proved impractical due to problems with sound insulation and maintenance. Each building has over a thousand apartments, and finding the right entrance out of 26 is not an easy task. The buildings are located not far from Mosfilm studios, and so they were often featured in Soviet films, including the Oscar-winning Moscow Does Not Believe in Tears. A new terminal of this Moscow airport was opened specially for the Olympics. During the Olympics, over 460,000 foreign guests traveled through it. Nowadays, Terminal F is used for flights by many European airlines. It also has the biggest duty-free shop in Sheremetyevo. If you have time before your flight, you can also pop into the nearby Sheremetyevo History Museum. In 1980, this indoor velodrome was the biggest such facility in the world. The building design resembles a giant butterfly, and its cycling tracks allow riders to reach speeds of up to 100 km/h. Over the years, around two hundred records have been set here. The velodrome is still in good shape and used to host track cycling competitions and training sessions. 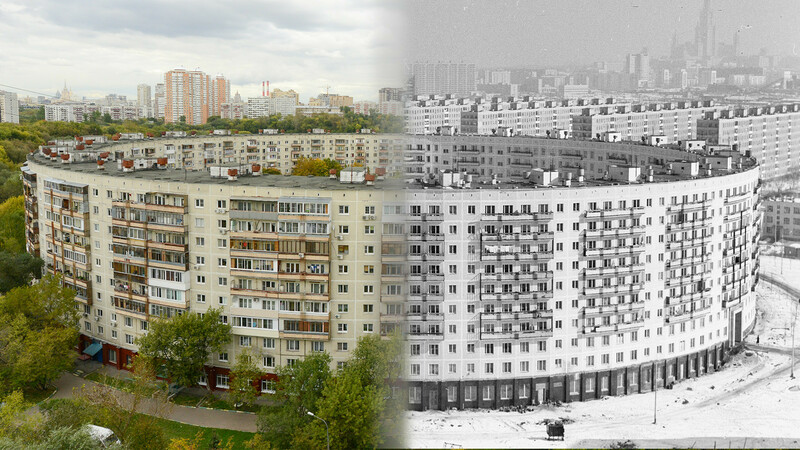 The area in southwest Moscow where athletes lived is a residential district nowadays with about 15,000 Muscovites living here now. The buildings are typical 16 and 18-floor prefab-panel apartment buildings. The city residents also inherited a beautiful park with cycle lanes and sports facilities. The building of the former administration now houses the State Museum of the Defense of Moscow and the former Olympic Village’s cultural center, along with a theater and concert hall. French architects and Yugoslav builders were involved in the large-scale construction project for this 25-floor hotel on Prospect Mira, and singer Joe Dassin performed at its opening. After the Olympics, the hotel hosted major foreign delegations and became a venue for television shows and international festivals. It is also featured in the blockbustermovie Day Watch when one of the main characters drives her sports car along its semicircular-shaped facade. The construction of the Olympic press center began in 1976. It has several conference halls and a cinema/concert venue. Nowadays, the enormous building near the Park Kultury metro station is home to RIA Novosti news agency.